YIWU, China/MALASZEWICZE, Poland -- When cargo trains from China began arriving at the Polish border town of Malaszewicze almost a decade ago, they were considered a novelty - able to ship laptops and cars to Europe in as little as two weeks, but extremely infrequent, with one service a month. However a surge in the number of trains over the past year, fueled by Beijing's plans to grow trade along ancient Silk Road routes to Europe, has left authorities scrambling to meet demand that has ballooned to as many as 200 locomotives a month. Rail shipments have experienced delays of over 10 days at land ports in both Europe and China, bogged down by insufficient infrastructure and paperwork pileups, shippers say. That congestion is anticipated to worsen as Chinese authorities encourage a further ramp up in volumes. The situation illustrates how China's Belt and Road initiative is delivering some successes but also how its partners are struggling to keep up. The rail network, used by companies like Hewlett Packard , the sports gear company Decathlon and the carmaker Volvo, handled 3,673 train trips between China and Europe in 2017, up from 1,702 in 2016 and just 17 in 2011, according to China Railway, the national operator. The network remains unprofitable and heavily supported by subsidies, but Chinese city authorities have launched new services with fervour after it was subsumed under the four-year-old Belt and Road initiative. In 2016, China's top state planner named the network "China Railway Express" and said it wants train trips to hit an annual number of 5,000 by 2020. By April, the number of regular rail services linking China and Europe jumped from just one in 2011, between Chongqing and Duisburg in Germany, to 65, connecting 43 Chinese cities and 42 destinations in 14 countries including Spain and Britain, China Railway said on its website. Carsten Pottharst, managing director of InterRail Europe, is among a number of freight forwarders who expressed frustration to Reuters about congestion on the network, citing insufficient government investment in European railway infrastructure. "They believed that they would come, but they didn't believe that it would become that big," he said. While congestion occurs across the network, much of the shippers' frustrations are being directed at Malaszewicze, which handles roughly 90 percent of the cargo. There, containers which travel from China through Kazakhstan, Russia and Belarus on Russian gauge tracks are transferred to other trains running on European standard ones. The land port processed nearly 74,000 containers in 2017, 4 times the volume it handled in 2015, earning Poland nearly 400 million zlotys ($109.02 million) in tax and customs revenues last year, Polish tax and customs authorities said. 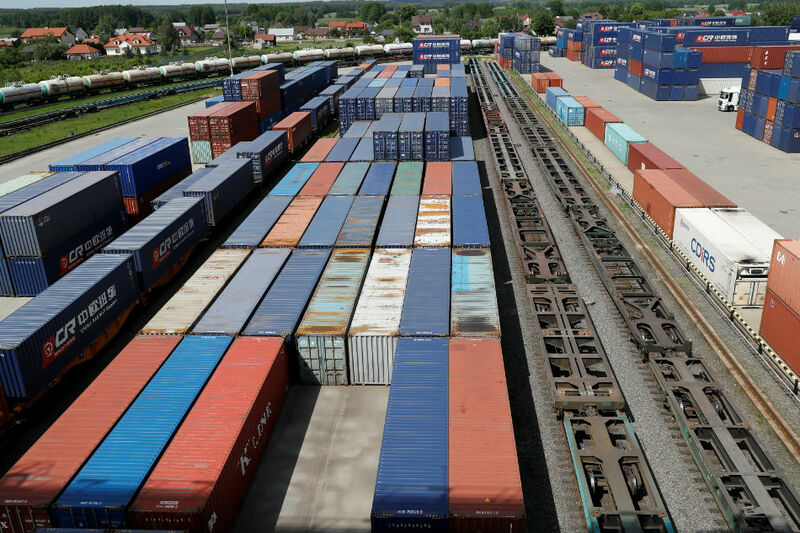 But PKP Cargo, the Polish state-controlled rail operator that runs the main terminal, said in March that the current infrastructure was unable to handle the anticipated growth. Europort, which runs a private rail terminal, said that in late 2017 there were queues as long as 100 trains awaiting entry to Poland from Belarus. "This is a huge challenge and a huge chance," said PKP Cargo's chief executive, Czeslaw Warsewicz in March. PKP Cargo said in an e-mail that there were currently no queues at its terminal, and that it was looking to expand capacity and cooperate with private terminal operators to shorten loading times. Poland's infrastructure ministry, meanwhile, said the government was considering opening a second border crossing with Belarus. However, shippers say they are concerned that the improvements will not happen fast enough. This is worrying locals such as Krzysztof Iwaniuk, mayor of Terespol Municipality, which includes Malaszewicze, who has seen the town and surrounding areas benefit from the rail trade. On a recent visit to Malaszewicze, Reuters saw navy blue shipping containers emblazoned with the China Railway Express logo stacked up in rail terminals, as well as new roads and a local government headquarters. Iwaniuk said he was worried that PKP Cargo's upgrade plan would not meet anticipated volume growth and that the town would lose traffic to other transhipment hubs. "We are sounding an alarm that we use this historic opportunity," he said. "If we don't properly use these five minutes in history, it will be over." In China, meanwhile, the flood of containers into Europe is expected to keep surging as city authorities try to outdo each other promoting Belt and Road, President Xi Jinping's signature foreign policy initiative. Chongqing in southwestern China, which recorded 663 trips last year, is targeting 1,000 trips, while Xi'an, home to China's terracotta army, also wants to hit 1,000 trips, according to state media and government statements. Yiwu city in the eastern province of Zhejiang, home to one of the world's largest wholesale trading centres, plans to increase trip numbers from 168 in 2017 to 350 this year, said Simon Jian, assistant to the chairman of Yiwu Timex Industrial Investment, a rail service provider. Industry executives say the network is currently unprofitable as cargo volumes have not reached a sustainable level, and costs are higher than shipping by sea. But it is attracting business from companies selling goods like cars and electronics because it can deliver them as much as 20 days faster than sea at a lower cost than by air. "We've probably managed to reduce our logistics costs thanks to China Railway Express," said Hu Jie, a Suzhou-based logistics director at Pegatron Corp, a Taiwanese electronics manufacturer that began using the rail route in 2015. For now, Chinese government subsidies are supporting the rail operations. A study published by the Shanghai-based Donghua University last year estimated that provincial governments in China had collectively spent $303 million subsidizing China-Europe block trains - generally those carrying goods to destinations without being split up en route - between 2011 to 2016. Jian said that firms would likely need to charge $10,000 per container to make a profit but subsidies allowed many to charge about $3,000-6,000 per container. Some were offering rates as low as $1,000 per container, about the same as shipping by sea. "It's very chaotic," he said. There is currently far less rail congestion on trips back from Europe to China, reflecting the large trade deficit between two partners. Polish government sources said there was concern that China was not doing enough to open its market to foreign producers. One official said there was growing concern that the new Silk Road might become a one-way gateway to flood Europe with China-made goods. The United States is currently threatening a trade war with Beijing in a bid to cut its own trade balance with China. As trains pile up in Malaszewicze, some shippers are looking to move goods through Finland, which launched a rail freight service with China in November, or Lithuania and Estonia. But new transhipment hubs also had drawbacks, they said, citing longer travel times and less familiarity with services and issues like processing paperwork. "We need the entire network to be upgraded and more railway stations to be built," said an executive at Wuhan Asia-Europe Logistics, which manages trains from Wuhan, in central China. Ronald Kleijwegt, the managing director of Jusda Europe, a logistics unit of the contract manufacturer Foxconn, said that would be an uphill task in Europe. "It's a win-win if we start ironing out all these bottlenecks," said Kleijwegt. "But the demand and requirements of supply chain are sometimes difficult to understand for politicians to understand."